The FLAT command allows you to calculate a flat-field without having to take specific images at twilight, on a white screen, on a light box, .... The flat-field can be obtained from merely the images of the observed objects taken during the night. you do not have a standard flat-field and the night images contain dense star fields or extended objects. you do not have a standard flat-field and the night images are planetary images. In these two situations, correctly extracting a flat-field with a median set technique is very unlikely. The FLAT command uses an iterative process and works with the logarithmic values of the images. It is recommended to have as many images as possible to get the best result (typically between 5 and 10 images, the maximum number allowed is 15). The dark current and offset signal must have been subtracted from each image. The images must have the same signal level (for the control, use the sky background level at the same place on the detector, or the level of a common detail in each images). Use the OFFSET command to adjust the levels. the images must be of the same celestial object and must be taken through the same filter if one is used (this last condition is a general rule for flat-fields, no matter which technique is used). If ai is the displacement vector of the image "i", and aj is the displacement vector of the image "j", there must not be a real constant k such that ai = k*aj. 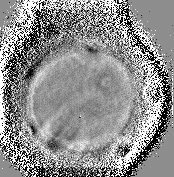 The displacement values do not affect the quality of the result. However, it is recommended to not displace the images too much, because the complete calculation of the flat-field image can only be done on the parts common of the image set. The parts of the flat-field outside the common area are still valid, but they are calculated with less precision because a smaller number of images is concerned. Also, note that the calculation time grows with the displacement values. Large image are prohibed because the large computation time (up to 400 pixels size image are correct). It is recommended to choose the reference image (first image) so that the relative displacements are as isotropic as possible for the set of images. Before executing FLAT it is necessary to produce the file SHIFT.LST containing the relative displacements of the images with respect to the first image. Each line of this file contains the displacements with respect to the reference image (first the displacement along the X axis, then along the Y axis, with one or more blanks between the numbers). The first line of this file contains the elements of the first image (the reference image), that is (0,0). This file can be created with a word processing. Remember that automatic registration commands in Iris (REGISTER, PREGISTER, the registration tools of Processing menu, ...) produce a shift file SHIFT.LST in the woking directory. [#IMAGE]: the number of images to be used in the calculation (between 5 and 15). [#ITER]: the number of iterations. This number is chosen as a result of the previous tests. Typically, between 1 and 3 iterations are used. [HL]: eliminates pixels with a level over [hl] from the calculations. This can be useful when processing a field with saturated stars (because the saturated parts do not contain radiometric valid information). In general, [HL] should have the value of the maximum dynamic range of the image. [LL]: eliminates pixels with a level less than [LL] from the calculations. In particular, the value of [LL] can be adjusted to reject pixels with a negative value, thus [LL] is usually 0. [LEVEL]: the generated flat-field will have the average intensity [LEVEL]. Most of the time this value will be the same order of magnitude as the average level of the processed images. [LEVEL] must be greater than 1. Remember, the FLAT command can reconstruct a flat-field by using non-uniform background illumination sources (i.e. deep-sky images, Sun ou planetary surface images, and so on). 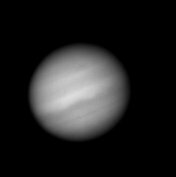 The key principle is the precise knowledge of the value of small displacements of the telescope between exposures. 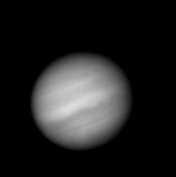 Raw images of Jupiter (no flat-field applied of course, correction, no contrast enhancement). 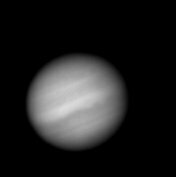 Note the random shift between CCD frame. Flat-field synthetised by FLAT command. is only valid in commun region of Jupiter images).